Palisades Free Library has booked a special event for Thursday, February 23 at 7 p.m. at the Library featuring Serbian author and global activist Srdja Popovic. 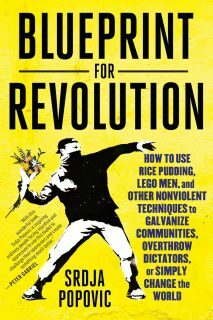 “Blueprint for Revolution: How to Use Rice Pudding, Lego Men, and Other Nonviolent Techniques to Galvanize Communities, Overthrow Dictators, or Simply Change the World,” a visit by author Srdja Popovic is a special opportunity for peaceful protestors, activists, and community organizers to join Serbian author and global activist Srdja Popovic in a discussion about non-violent resistance. One of the founders of the Serbian non-violent resistance group Otpor!, Popovic is now Executive Director of the Center for Applied Nonviolent Actions and Strategies (CANVAS), which he founded in 2004.